So I am trying to be more consistent with my posting like I mentioned before so here I am posting again. So some pictures will be newer ones, while others will be older ones. I think the shop has hit the winter slump that happens to small businesses because orders are coming but not like they were the snow hit. Darn snow! But I can say that the snow has allowed me to seriously think about the goals for my business for this year and changes I would like to do to the shop. I have also been working on some up coming events that I would like to have in the next couple of months. 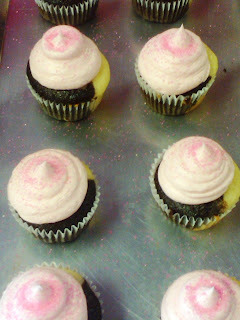 One of them is a Valentine Cupcake Party for kids on February 12th. So instead of the Mommy & Me classes which only allow for 4 kids at one time.. this party will be for a much bigger group where kids can really interact with one another also they will be doing some crafting besides decorating cupcakes. We are also having out first Poetry Cafe on the 25th of February featuring local poets and of course there will be plenty of yummy cupcakes and gourmet coffee for everyone. I have also finally come up with a design for the cake competition I will be in next month. I am soo excited about this because the cake decorator who wins will be featured in Susquehanna Style Magazine and that can do big things for a small business like me! So I will be working on some sugar flowers next week and will be taking pictures to chart my progress. I will also be posting pictures on here and Facebook of some of my Valentine's specials so if any of you are interested in ordering you will be able to see some of the goodies. Now on tooo the cakes! Monkey Zebra Theme Cake- Neapolitan cake flavor and decorated with 8 fondant monkeys all at different ages and doing different things. By far one of the cutest cakes we have done. Eagles Birthday Cake- Everything is edible with the exception of the Eagles symbol. Footballer is made from fondant. Sweet 16 Topsy-Turvy cake- Vanilla cake with Vanilla Buttercream. The client brought in a picture and wanted me to replicate it which I did with some minor color changes. Purple Zebra Print Sweet 16 Cake- Chocolate cake with Vanilla Buttercream. Another client who brought in the picture of what she was looking for. Doing the spirals on top was a bit of a challenge because the balls didn't want to stay where I put them but I told them who was boss! LOL. Thomas the Tank Sheet Cake- Chocolate & Vanilla cake with Whipped Icing. Thomas is made from fondant along with the other decorations. I don't really do cake covered in whipped icing or buttercream but when a client asks for it I deliver. Chocolate Hazlenut Praline Cupcakes- another new cupcake flavor that I just came up with last week. Chocolate cake with a hazelnut praline sauce baked into the cake. Topped with Chocolate buttercream and more sauce on top. I made these beauties for a donation that ended up at a baby shower. 21st Birthday Cap Cake- So this is another attempt at carving 3-D cakes and I am getting so much better. Lemon cake with Kit Kat Chocolate Buttercream filling. Black geeky glasses and an IPOD nano complete the cake. Design was based on what my client said her son liked. Air Jordan Retro Sneaker- 3rd attempt at cake carving. This one was way more difficult than the other two I have done. Vanilla cake with vanilla buttercream. Well that's it for now..but more pictures are coming along with more Valentine's information and pictures. So this post will be short because I am very tired about painting my living room and getting caught up on washing clothes, cooking dinner and some other things today since the shop is closed on Mondays. So I am going to be posting some up to date pictures first and then go back over the next week or so. I am also trying to get together website changes and planning events for the shop. So as you can see my plate is very full! So before I fall asleep...on to the cakes! Ladybugs & Daisies Birthday Cake- Chocolate cake with Oreo Buttercream filling. Fondant ladybugs, daisies and royal icing butterflies. Order for a little girl turning 5 who loves her ladybug pillow pet and the color purple. Cinnamon Roll Cupcakes- Every week I try to bake up at least 2 gourmet flavors for the shop. Well this one going to be a flavor this week. I made these for a friend's son birthday party. Cinnamon roll flavored cake with maple buttercream and topped with crushed pecans and cinnamon sugar. Lime green, black and white Baby Shower cake- Berry Overload cake done in buttercream basketweave technique. All of the baby items are made from fondant. This cake and the next one were made for a client in Baltimore, MD that drove down to pick them up. His wife was having a baby shower and it was her birthday. He said that she loves Gucci so I made her a Gucci purse and a Gucci diaper bag. I took some liberties with the design but I love the way they both came out. and since I don't get that many 3-D cake orders I jump at the chance to do them. Cake is Red Velvet with Cream Cheese Buttercream. All pieces are made from fondant. Gucci Diaper Bag Cake- Chocolate cake with Oreo Buttercream. White and pink fondant details. Hot Wheels Sheet Cake- Half vanilla with oreo buttercream and half strawberry with vanilla buttercream. 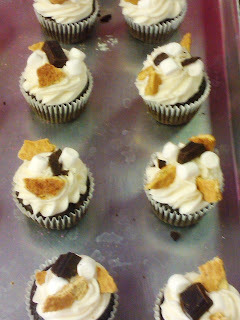 S'mores Cupcakes- Chocolate cake with Vanilla Buttercream. Cake has graham cracker bits baked at the bottom. More graham cracker bits, chocolate chunk, and mini marshmallows. Neapolitan Cupcakes- Half chocolate and half vanilla cake with strawberry buttercream and pink sprinkles. Pink & White Flower Cake- So I made this cake for a friend of min and my hubby's co-worker. She is very sweet and watches Jayden from time to time so I thought it would be nice to make her a cake for her birthday. Chocolate cake with vanilla buttercream. Flower is all marshmallow fondant. This post is going to be very short because I am in the mist of working some exciting things for the shop and revamping some parts of my website. All in order to provide better to my clients and mores accessibility and visibility for the shop. I didn't want the week to go by without saying Happy New Year and letting everyone know that there is much more coming from Kima's Konfections in the next couple of weeks. I have restarted the email list for specials and now coupons :) so if any one is interested please email me at Hakima@kimakonfections.com to be added to this list you will be able to add yourself with the click of a button on my website very soon. Also coming soon will be the option to order certain items from the website directly! More on that and other announcements coming the end of this week and the beginning of next week!